FORKS, WA—In the face of rising public anger, the U.S. Border Patrol and Immigration and Customs Enforcement (ICE) have ended their practice of stopping traffic at checkpoints on U.S. Highway 101 arresting undocumented immigrants, many deported to Mexico overnight. The unannounced change came several months ago. Residents noticed that the last roadblock was taken down last September 9 in the face of marches, vigils, and mass demonstrations initiated by the Stop The Checkpoints Committee (SCPC). Anger was stirred by the arrest at a checkpoint last summer of Edgar Ayala, 18, a mile or so from the home where he had lived since infancy. A star on the wrestling team, he had just graduated with honors from Forks High School. He was deported immediately to Mexico. She added, “We need to make these immigrants legal so they can pay taxes and not be abused. I’ve been here thirty years. I’m very attached to the family-values workforce. With Obama in the White House, I’m very hopeful.” Her comments came just days after Homeland Security Secretary, Janet Napolitano, announced a shift in emphasis from targeting immigrants to targeting employers raising hopes that ICE and the Border Patrol will end their workplace raids, mass arrests and deportations that have torn immigrant families apart. Danks, a leader of Radical Women, urged a fight to stop the planned construction of a new Homeland Security Detention Center near Port Angeles and the scheme to arm Coast Guard cutters and search and rescue helicopters with 50 caliber machine guns. “Stop militarizing our borders. Normalize our borders,” she said as the crowd applauded. The SCPC delivered 518 petitions to Rep. Norm Dicks (D-WA) field office in Port Angeles, recently, asking him to oppose funding for the new detention center. The Border Patrol now has 25 agents on the Peninsula up from only four agents two years ago. Dicks, who sits on the House Homeland Security Committee, released a statement that it is “not clear” to him the “security value” of inconveniencing thousands of travelers at roadblocks in his district. Danks told the World SCPC is still celebrating a partial victory in winning release from prison of Tony Hernandez and stopping the instant deportation of his fellow worker Daniel Rodriguez. The two workers, employed by a landscaping company were driving in a truck to work when they were arrested in Sequim, WA. Hernandez is a legal resident who lives with his wife and two children in Sequim. But he had left his “green card” at home. The agents, Danks, said, refused to listen to Hernandez’ pleas and immediately transported him to a detention center in Tacoma. Rodriguez is not documented but has lived and worked in the U.S. for many years. 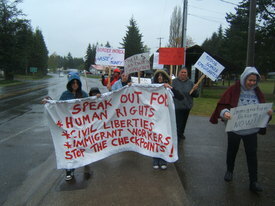 The SCPC organized a picket at Sequim’s main intersection the next day demanding release of the two men. “Tony was released and has returned to his family in Sequim,” Danks said. Rodriguez is now awaiting a hearing on his appeal against deportation. Jefferson County Sheriff, Mike Brasfield, told the crowd his officers “will not get involved” in immigration enforcement. “We do not have any right to issue an infraction in that situation,” he said. Port Townsend Police Chief Conner Daily echoed that promise. Both received prolonged ovations.